What Is It Like Living In The Desert On A Man Camp? I spent 3 years of my life living on a man camp in one of the most remote deserts in the world. The Ras Al-Khair Desert of Saudi Arabia to be exact. Oh, you don’t know where that is? Neither do I, and I have lived there. In fact, I probably could not get back to the man camp even if you asked me to take you there. Before I dive into the story, let me show you a quick video to negate any suspicion that you may have in regard to the veracity of my journey. 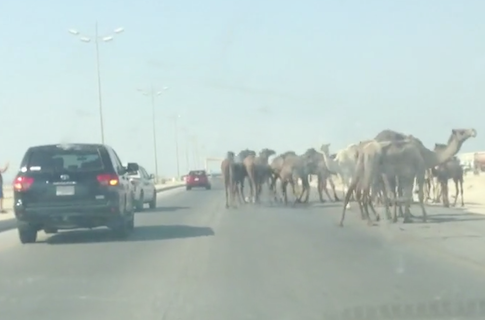 Camels in Saudi Arabia from Untemplater on Vimeo. So now that I have your attention, let me tell you my story. I previously worked for one of the world’s largest Engineering & Construction companies as a project controls specialist. If you actually care what that is, ask me in the comments, but I will spare the 99.8% of you that don’t. It was a great job and because it involved heavy exposure to budget development, cost tracking and predictive modeling, I still apply many of the analysis techniques to my personal finances. Maybe a little too much. It was 2007, and the global economy was in a state of turmoil. However, the heavy construction industry is very cyclical in nature, which meant the downturn in one business line would create vast opportunity in another. This cycle was no different. The collapse of the US dollar caused a major spike in the value of precious metals. Gold, silver, aluminum and other metals began to surge in value. As a result, massive unprecedented mining & metals projects moved quickly into the spotlight. But where there is heavy mining, there are massive deserts. Unfortunately, those massive deserts are located in some of the most remote locations around the world. It was the start of the international mega project construction boom. Australia anyone? You are probably thinking I am an idiot because I ended up in #3. Let me explain my rationale…then you can call me an idiot. The “uplift” – this the percent that your base salary is increased for that specific assignment. It does not carry with you once you leave the project. The R&R schedule – because major projects are under construction 7 days a week, work weeks usually range from 60-70 hours a week if not more. As a result of how demanding these work weeks are, in conjunction with the living conditions, you are given rotation based assignments. For example, you may work 8 weeks straight, 7 days a week, and be given 2 weeks off before having to return to start your next rotation. These vary by project and location. The Overtime (OT) policy –Almost every construction project pays you overtime. The question really becomes at what rate. Often times OT is paid at your base salary rate. Other times you get a multiplier for any hours worked above a threshold depending on the labor laws of the country you are working in. The living conditions – Sounds obvious, but the living conditions from project to project are significantly different. On some projects you may share a room and bathroom with multiple people, other projects you might get your own room. The food, entertainment, weather, culture are all aspects to consider if you are going to spend years on a job site. For example, when most people think of Nevada, they think Las Vegas. But what if you had a job assignment that meant actually going to live in the middle of the Nevada desert…in a tent…with 4 other people in it…sharing a bathroom. Would you still be as excited? My point is, the types of job sites in my line of work, are not in desirable locations no matter what country you are in. So you have to weigh all the aspects of the assignment. Although Australia seemed the most desirable choice and offered reasonable living conditions, the uplift, R&R schedule and OT policies were far from favorable. My major motivation was a chance to travel the world, and if I was going to leave my friends and family for 3-5 years, I was certainly going to figure out the best way to inject my bank account with steroids. It did not take long to decide that I was going to Saudi Arabia. The expat package was awesome, and I had two close colleagues and friends that had been there for a few months, and indicated it was reasonable living. Keep in mind I was making my decision just before the Arab Spring began, so the security and safety concerns were less of an issue at the time. Uplift: 40% increase to my base salary. R&R Schedule: 60 hour work week minimums for 8 weeks straight followed by 2 weeks of vacation. This included a $3,600 travel allowance paid every 8 weeks. OT policy: 1.5x salary rate for all hours over 48. This meant a minimum of 12 OT hours a week. Living Conditions: A man camp in the desert. As it was Saudi Arabia, no women were allowed on site. Every person had a private room and bathroom within a large trailer comprised of 8 rooms. The food was terrible, and there was little to no entertainment. Spotty internet at best. TV mostly Arab channels. Rather than explain how much financial benefit there was from this package, though you can probably do the math, let me demonstrate the financial difference between a week of work in the U.S office vs. one on the man camp in Saudi Arabia. For those that love to analyze numbers, it is important to note that the hourly rate in the office and the man camp are nearly the same despite a 40% increase because of the way the Saudi Labor laws work. They are required to pay you 365 days a year, but as a result they do not use 2,080 hours as their denominator. To make up for this, you get 56 hours of standard work week pay even though you only work 48. This was because Friday was a holy day and no one worked unless you had approved overtime. Then there are the added tax benefits you can see from above. When you work on assignment overseas you are eligible for foreign tax incentives. There are many rules you must follow in order to qualify for them, the most significant being you must not spend more than 35 days a year in the United States. This was not easy. It meant many months away from family and friends, and missing the holidays we come to enjoy with family. In fact, I missed 4 Thanksgiving holidays in a row, the birth of my nephew, and countless celebrations to name a few. The only saving grace was that Saudi Arabia was so far from the United States that it made it easier to justify traveling in the local region during each 2 week R&R. After all, if you have 2 weeks off you don’t want to spend 4 days of it flying every time. So what do you do with all those vacation days? Where do you go? Let me show you. After it was all said and done, my friends and I travelled to over 45 countries and 85 cities around the world. Now I can’t lie; we spent more money than we should have on these trips, but when you are trapped in a desert for 8 straight weeks with nothing to do, it is nearly a requirement. But with the $3,600 travel allowance, and the fact we were still being paid while on vacation, we rarely ever dipped into any of our savings. We can’t forget the major benefit of having $0 of expenses whatsoever while on the man camp, as all accommodations, food, and transportation were provided. I am always asked the same question, “was it worth it”? Yes. No question. Now this story pertains to my time in Saudi Arabia, which is obviously not the premier choice for women. However, that is a rare exception, and there are a ton of other locations across numerous industries that have no restrictions. Should you consider doing something similar? The decision to take on this type of life altering challenge and experience requires a lot of sacrifice. Nothing comes easy. Yet the benefits that come with embracing such an experience are overwhelming. You will be able to travel and see the world, work towards eliminating any and all debt you may have, have the means to afford a nice down payment on a home upon return, and possibly even start your own business based on your international experience. If you have any burning questions as to the details of life in a man camp in Saudi Arabia, drop a comment below, find me on Twitter @misfitmoney, or contact me at Misfit Money. What a fascinating story! I’ve never seen a camel in the “wild” before. That would be crazy to just find them hanging out in the road like that. 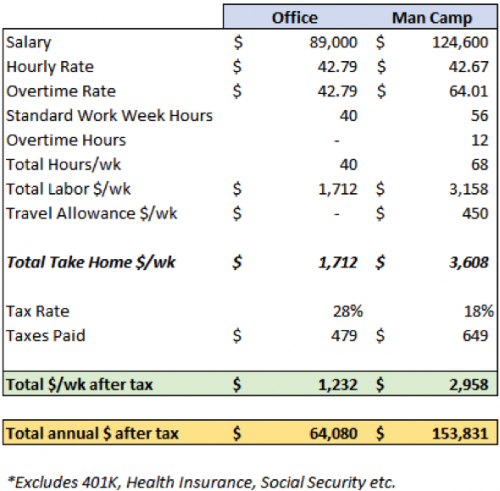 Helpful insights on the comparison of costs of living between your office earnings versus living on the man camp. I’d never even heard of a man camp until we first emailed! What a unique set of experiences you’ve had and that’s fantastic you got to travel to see so many places on your weeks off. I think I’d spend a lot living it up on travel too if I was isolated in the desert for so many weeks at a time! Sounds like you had a lot of fun that you’ll never forget! It was extremely rewarding both financially and personally. There were times where it was extremely difficult, but I would do it all the same if provided the same choice. 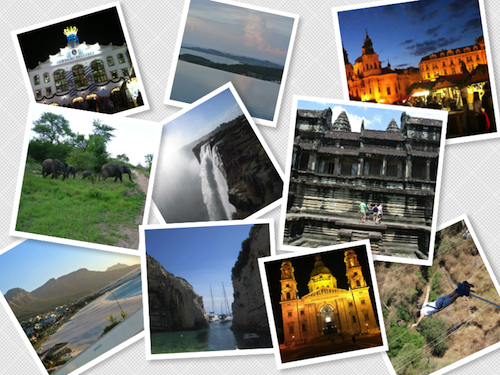 If anyone ever needs insight on some of the great cities to visit around the world, don’t hesitate to ask! Australia sounds way better haha! But you are right, lots of benefits to choosing the road less travelled so you can end up traveling and earning more. Great article. Hi! Great insight on the pros and cons of an expat living onsite. I have been recently offered a job in Ras Al Khair, I was wondering if you consider feasible to commute between Jubail and Al Khair, and if so, how do you find life in Jubail.